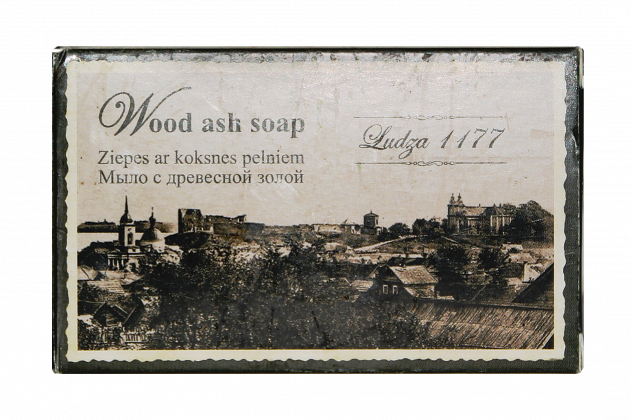 Wood ash soap is made in the oldest town of Latvia - Ludza. Wood ash has been used as a washing and disinfection agent for centuries. Application: apply to moist skin, gently massage in and rinse off. Contraindications: individual intolerance. Store in a dry, dark place at the temperature of +5°C up to 25°C. Keep out of reach of children. Ingredients: Aqua, Glycerin, Sorbitol, Sodium Stearate, Sodium Laurate, Propylene Glycol, Sodium Oleate, Potassium Hydroxide, Sodium Myristate, Sodium Chloride, Glyceryl Mono Laurate, Cocamidopropyl Betaine, Eucalyptus Globulus Leaf Oil, Tea Tree Leaf Oil, Mentha Piperita Oil, Sodium Benzoate (and) Potassium Sorbate, Cocos Nucifera Oil, Sodium Thiosulphate, Sodium Citrate, Citric Acid, Trisodium Sulfosuccinate, Pentasodium Pentatate, Tetrasodium Etidronate.